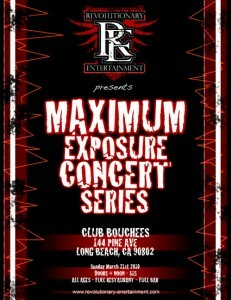 Hollywood Music is a Proud Sponsor of The Maximum Exposure Showcase. The concept came to me from producing another show called, Guitar Center’s Rock N Roll Superstars Battle of the bands, which ran in various clubs from Jan 2007 until August of 2009. I began producing the battle of the bands show back in January of 2007 at a large club that no longer exists now, and then took the show to Venezia Grill in Redondo Beach, Kilkenny’s in Redondo Beach, and Club 705 in Hermosa Beach. Throughout that time I began working with different media affiliates, gained the respect and trust of credible music A & R’s , Music Managers, Music Supervisors etc . But as my own career grew at Revolutionary Entertainment, I did not feel like the independent bands that were a part of the contests careers were growing in the right direction as far as them understanding that they have to be the ones to jump start their own careers because the music industry will only support you, but not make the music for you. It was surprising to me because even after all the great media/music industry connections they made by doing my show, most of the bands would only focus on was whether or not they won the contest. So at the end of August 2009 , I was stuck in traffic going down the 405 S actually on my way to one of the Battle shows in Hermosa, and it finally connected with me that I needed to create and produce a new show that would run like a music festival that would have multiple stages, clothing/food vendors , signed bands along with the unsigned bands to give independent bands just a taste for what life could be like for them if they listened to the Media Affiliates and Music Industry connections that always support everything we do here at Revolutionary Entertainment. 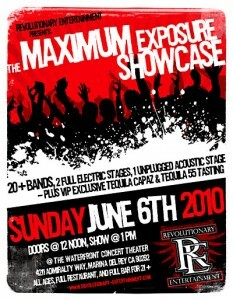 So in January 2010 marked my first festival for the Maximum Exposure Showcase down in Long Beach. Our headlining bands were Sugarcult, I Am Ghost (Epitaph Records), Modern Day Escape (Standby/Victory Records), The Becoming (Tooth and Nail Records) and No Bragging Right + 40 Must see Local bands on 3 stages. We had a great turn out of over 2,500 people , we scaled down for our next MES only having two stages, and we have now added an Acoustic Singer Songwriter stage for the next MES on June 6th @ The Waterfront Concert Theater. We are all excited to see how the response will be for the new stage addition for our regular MES crowd. So , if there was a specific vision for the Maximum Exposure Showcase , it would be to combine all of the different elements that make an independent band successful , have them all be in one place at one time , the bands would meet these success elements in person and the elements of success would meet them. Then later in the week everyone would get together again for the official Music Festival. Therefore that is why there is always a Pre-Festival Party that is a private party not open to the public so the independent bands get a chance to meet and work with Loren Israel who is responsible for signing Jimmy Eat World, Plain White Tees, Sugarcult, Less Then Jake, and The Neon Trees, Restless Management is also there they have managed bands to get deals with Universal Motown Records, Trustkill Records, Interscope, Tooth and Nail, I also write for Music Connection Magazine & Chopperhead Magazine, Music Supervisor Peter Davis always attends the festival as well he has licensed independent bands’ songs for MTV Real Road Rules Challenge, The Kharashians, Khloe & Courtney Take Miami, Project Runway. Then, of course, Revolutionary Entertainment has an exceptional network of Radio and Music TV shows, (like our good friends at Hollywood Music TV !!! ), that all focus on promoting independent artists as well. I always look forward to hearing from both fans and new bands. The best way to reach me is through our website at www.revolutionary-entertainment.com. And as a special thank you, the first five people to contact me through my website and mention this page will receive two free tickets to the Maximum Exposure Showcase on June 6th, 2010 in Marina Del Rey, CA.